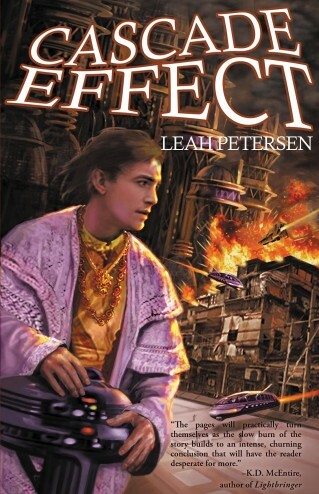 Cascade Effect is Leah Petersen’s follow-up to her debut novel, Fighting Gravity. In the first book Petersen skillfully paired world building and narrative pacing to introduce readers to a galaxy spanning empire and the relationship between Jake, a scientist born in the slums of Mexico, and Pete, emperor of all creation. The sequel, set some years after Jake’s and Pete’s marriage, dives headlong into a world of court intrigue and interstellar governance. This change in focus presents some potentially daunting challenges. Petersen’s ability to design an empire that is honest to historical precedent becomes something of a double edged sword; therein it is very hard to put an Emperor and his Prince-Consort into the center of action. Despite Jake’s hot headedness, he is part of an institution where things are done for him. In terms of story structure, this means we witness the principal players reacting to external factors far more than they act upon their own volition. Left to the hands of a lesser writer, such a situation could get boring very quickly. To Petersen’s credit, she mobilizes a number of effective conceptual spaces for Pete and Jake to inhabit during their reactions, which in turn work to draw the entire novel together. Most obvious is the novel’s allegory on class and entitlement. Though Fighting Gravity gave readers a taste of a future world strictly divided into orders which would have made a French nobleman blush, Cascade Effect delves deeper into the institutional discrimination of Pete’s empire. Not only does this shade the setting in a more interesting way, but it also justifies some of Jake’s perpetual thick-headedness as a character. When Jake puffs his chest, intent to confront a powerful Duke, he receives a stern Cersei Lannister-like rebuff on the rules of the world in which he now inhabits. Where being an un-class, the lowest of all social orders, was perhaps a convenient excuse to alienate Jake in the first novel, it now shapes the way in which he interacts with the world. Though this is a clear commentary from the author on contemporary issues of poverty and wealth, as a reader we are invited to seriously consider the merits of meritocracy paired with aristocracy. Despite Jake’s low birth he was elevated to a position of prestige and comfort by virtue of a system which seemingly oppresses the rest of the un-class. Even if the characters that defend this system are distasteful, it does not preclude a discussion on effective ways to order a society and a broader question on nature versus nurture in class distinction. Concurrent to the politics of Cascade Effect’s world, is the unfolding story of Pete and Jake’s marriage. Much of the court intrigue and various assassination attempts visited upon Jake stem not from an overt hate of him individually, but what he represents as an un-class marrying into the royal family. This, combined with certain events from Fighting Gravity, places a strain on Pete’s and Jake’s relationship. Even as a reader who has no measurable appetite for “romance” I found these sequences to be well handled. Pete is all forgiving, arguably to a fault, and Jake is stubborn to point of palpable frustration. This should result in a zero-sum game when it comes to their interactions. Yet I still found myself invested in their domestic squabbles as those conflicts are so intimately linked to the grander story of looming civil unrest within the empire. While there’s no doubt in my mind that the core story works quite well, there were some elements along the way which felt underdeveloped. Amid perpetual scandal and disdain from the imperial court, Jake takes solace in his science. When his research is usurped for military purposes, Jake’s outrage seems restricted to that particular movement within the novel. Granted, I could be picking at nits in this point, but the prose is rather intense in the way it sets up the potential for destruction at the hands of Jake’s would-be weapons. In turn, I was expecting something on the magnitude of the Manhattan Project, or some other suitable game changer. Perhaps this is a theme which will be revisited in the next installment of the series. Overall, Cascade Effect is a worthy successor to Fighting Gravity. With the focus shifting to Jake’s life at court, the novel is free to use the entirety of the empire as a means of bringing the story to the characters. Leah Petersen has done well to weave together the social science of science fiction, themes of court intrigue so often found within fantasy novels, and a thread of honest romance to bind it all together. Thanks for the review! I’m glad you enjoyed it!